Recently I got an email from a user saying that whenever he started his pc his monitor would go into standby mode and he would hear any beeps from the pc, only the fans would be running. He had to shut down the pc holding the shutdown button. Once the pc shut down he had to start again, this time it would start perfectly. I was able to help him in this matter as I had a similar problem when I got my new pc last month. The first question that arouse in my mind when I faced this problem was whether it was a hardware problem or a software problem. So, I tried uninstalling my graphic card drivers but unfortunately nothing worked out. Then I tried looking into my pc cables and tried one of my friends power supply and ram, still no result. Finally, I found out that it was a CMOS problem. Since I have an Abit motherboard I installed the flashmenu utility, then I updated the BIOS to the latest one. While updating I was asked whether I wanted to clear CMOS or continue with the same. I cleared it and the BIOS upgraded. The next time I started pc it started with a single start. I was finally relieved from this problem.Â Resetting CMOS is also helpful when you forget your BIOS password. Now the question arises what’s CMOS? CMOS refers to Complementary metal oxide semiconductor, it’s a type of semi-conductor chip that holds data without requiring an external power source. CMOS holds the basic instructions the computer needs to initialize its hardware components and boot up. These settings are known as the basic input output settings (BIOS), also referred to as CMOS settings. You can reset it by two ways- the soft way and the hard way. So let’s make it easy and try the soft way, i.e, by using a software. You can use a software like KillCMOS to reset your CMOS settings directly. It will reset your computer’s CMOS settings to the factory defaults. You can also try flashing your BIOS. Read your motherboard manual for more info. To clear your CMOS memory using this method, just shut down your PC and remove the power cable completely in order to ensure that there’s no current flow. Now discharge static electricity by touching anywhere inside the pc cabinet. 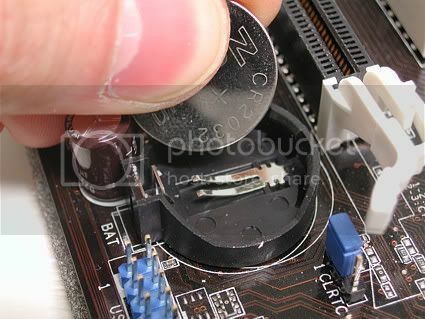 Locate the CMOS battery on your motherboard and remove it for about 10 minutes before inserting it back in. Now when you boot up your computer, the BIOS should have been reset with all values and passwords set to default. If you can’t locate your CMOS battery, refer to your motherboard manual. To clear your CMOS memory using this method, just shut down your PC, and check out the CMOS CLEAR or CMOS CLR near the CMOS battery. Check your motherboard manual for more details and to locate the jumper. Generally, you will need to remove the Jumper from it’s default position – the 1st and 2nd pin, and use it to short the 2nd and 3rd pins. This procedure may vary from motherboard to motherboard. Refer to the manual for detailed procedures. NOTE: I’m not responsible for any hardware damage that you may cause to your pc due to carelessness or wrong handling. Try it out at your own risk.